Page 280 of former minister and current Member of Parliament, Shashi Tharoor’s book Pax Indica contains an interesting assertion. Although Tharoor identifies the incident of St. Thomas being welcomed to Malabar by a flute-playing Jewish girl as part of folklore, he states that the arrival of St. Thomas to the Malabar Coast as a historical fact. Remember St. Thomas came to India when many countries in Europe had not yet become Christian and so these Indians who trace their Christianity to him have a longer history and a higher ancestry than that of Christians of many of the European countries. And it is a matter of pride for us that it happened…. 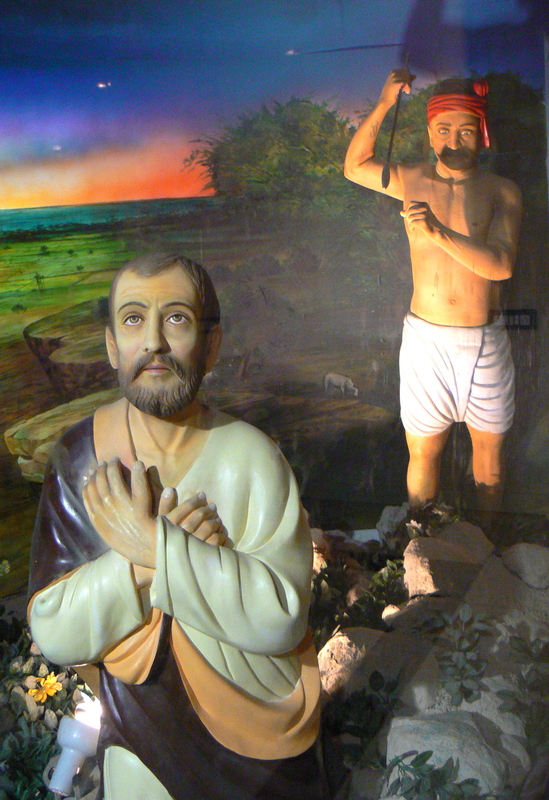 St. Thomas, one of the twelve apostles of Christ (itself a disputed fact), came to India in 52 CE. He landed at Maliankara (Cranganore) in Kerala, preached the Gospel, produced miracles, and got many converts. Then he went to Mailepuram (Mylapore), and from there to China, but after some time returned to Maliankara, and from there came again to Mylapore where he spent the rest of his life preaching, converting a large number of the low-caste Hindus. The aforesaid points make St. Thomas appear as socio-religious reformer who aimed to ameliorate the woes of local residents—specifically those suppressed under the caste system. As every tale of reformers goes St. Thomas was also disliked by the orthodox elements (which in the Indian context are the Brahmins) of the land that were determined to finish him. This risky situation made Thomas take refuge in a cave at a mountain located near the present St. Thomas Mount. Unfortunately the great Saint was murdered by one of those zealous Brahmins at St. Thomas Mount. His body was brought to Mylapore and buried in 73 CE. This sounds like a good story. And that’s what it is: a good story. All those statements on Thomas made by Tharoor, Nehru and Prasad are not based on any solid historical evidence. They are just repetitions of a well established legend. Cosmas the Alexandrian, a theologian, geographer and merchant who traded with Ethiopia and Ceylon, visited Malabar in 520-525 CE and provided the first acceptable evidence of Christian communities there as noted in his Christian Topography. There is no mention of any Thomas in his works. Regarding the fabled Apostle of Jesus, Thomas, early Church Fathers like Clement of Alexandria, Origen and Eusebius had stated outright that Apostle Thomas settled in ‘Parthia’, and established a church in Fars (Persia). This is supported by the 4th century priest Rufinus of Aquileia, who translated Greek theological texts into Latin, and the 5th century Byzantine church historian, Socrates of Constantinople, who wrote an Ecclesiastical History, the second edition of which survives and is a valuable source of early church history. None of those sources speak of St. Thomas visiting India. And to top them all, in September 2006, Pope Benedict XVI himself declared that Thomas never came to India. But his declaration was toned down after a complaint from the so-called St. Thomas Christians who still believe Thomas came to India and converted their ancestors. Now the question: where did it all begin? The chief source of this tale is a Gnostic Syrian fable, Acts of Thomas, written by a poet named Bardesanes at Edessa around 201 CE. The text says the apostle went from Palestine eastwards to a desert-like country where people are ‘Mazdei’ [a term used for Zoroastrians] and have Persian names. The term “India” in Acts is used as a synonym for Asia. The Acts identifies St Thomas as Judas, the look-alike twin of Jesus, who sells him into slavery. The slave travels to Andropolis where he makes newly-weds chaste, cheats a king, fights with Satan over a beautiful boy, persuades a talking donkey to confess the name of Jesus, and is finally executed by a Zoroastrian king for crimes against women. His body is buried on a royal mountain and later taken to Edessa, where a popular cult rises around his tomb. Even in this story, it is clear that St. Thomas never visited India. There is another popular fable among Indian Christians about one Thomas of Cana, a merchant who led a group of 400 Christians from Babylon and Nineveh, out of Persia in the 4th century CE, when Christianization of the Roman Empire motivated the Persians to persecute their Syriac-speaking Christian minority. These Christians apparently landed in Malabar around 345 CE. Based on this tale, a section of St. Thomas Christians believe Thomas of Cana to be known as St. Thomas. And so it is clear that nothing much is known about St. Thomas beyond these stories which have been refuted by historical evidence. Even after reading the refutation of this tale of St. Thomas by strong historical evidence, the likes of Tharoor will claim that these ‘fables’ are historical facts, in no less than a full length book of the genre Pax Indica belongs to. The reason is not far to seek: Tharoor’s parroting of the St. Thomas myth arises from the Indian secularist template for keeping the secular fabric of India intact. But there are deeper, more fundamental reasons why the St. Thomas myth must be debated and re-debated. The reason is given in detail by Sita Ram Goel in his Papacy: Its Doctrine and History. “Firstly, it is one thing for some Christian refugees to come to a country and build some churches, and quite another for an apostle of Jesus Christ to appear in flesh and blood for spreading the Good News. If it can be established that Christianity is as ancient in India as the prevailing forms of Hinduism, no one can nail it down as an imported creed brought in by Western imperialism. “Secondly, the Catholic Church in India stands badly in need of a spectacular martyr of its own. Unfortunately for it, St. Francis Xavier died a natural death and that, too, in a distant place. Hindus, too, have persistently refused to oblige the Church in this respect, in spite of all provocations. The Church has to use its own resources and churn out something. St. Thomas, about whom nobody knows anything, offers a ready-made martyr. “Thirdly, the Catholic Church can malign the Brahmins more confidently. Brahmins have been the main target of its attack from the beginning. Now it can be shown that the Brahmins have always been a vicious brood, so much so that they would not stop from murdering a holy man who was only telling God’s own truth to a tormented people. At the same time, the religion of the Brahmins can be held responsible for their depravity. This entry was posted in history writing, indian history, kerala, st. thomas, syrian christians and tagged benedict xvi, indian history, mylapore, saint thomas, shashi tharoor, st. thomas, syrian christians. Bookmark the permalink.